School Church in December sunshine: St George’s, Jesmond. 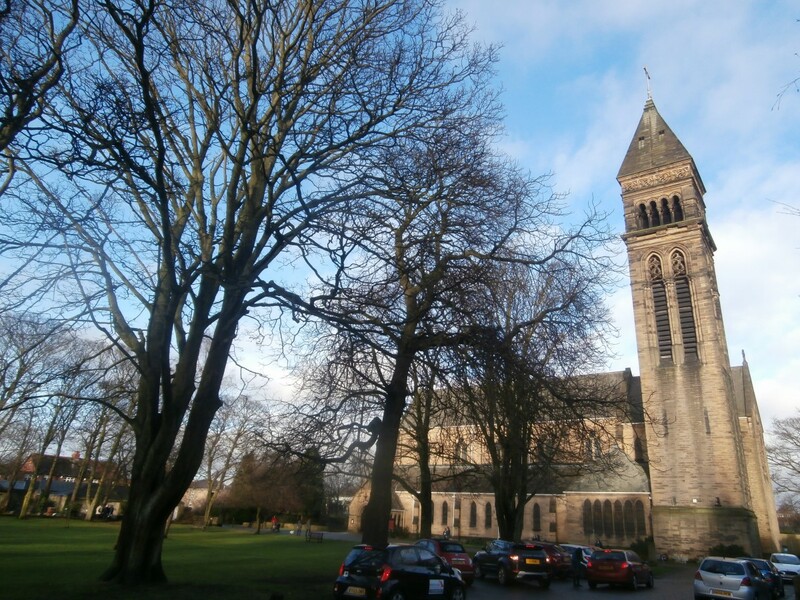 Wednesday 16th December was the last day of the Autumn Term at Newcastle High School for Girls, the day both starting and ending at St Georges’ Church, Jesmond where the School Carol Service was held. 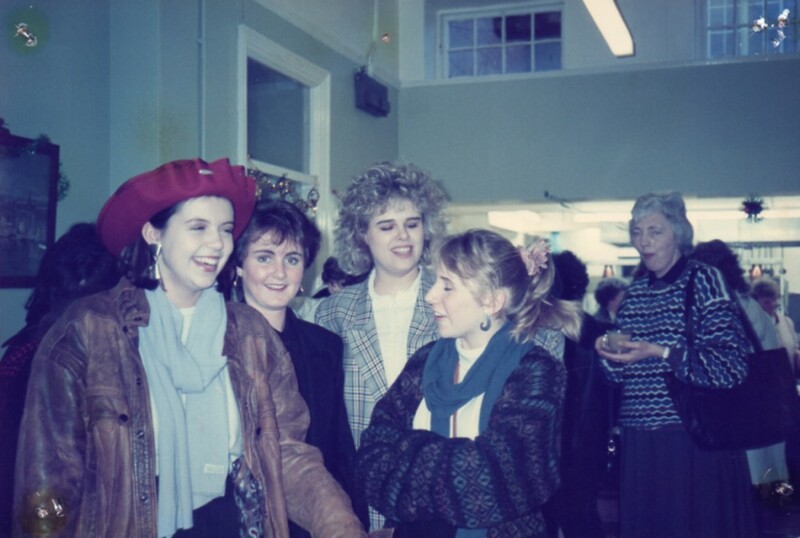 In recent years, the Church High Carol Service had been celebrated here too, though for many years it was held in the United Reformed Church next door on Tankerville Terrace, with hot mince pies provided in the Senior School Dining Room afterwards for all. Walking down Tankerville from St George’s via the railway bridge in crisp sunshine post-service, I arrived at the site from the opposite direction to usual and was presented with a disorientating surprise. 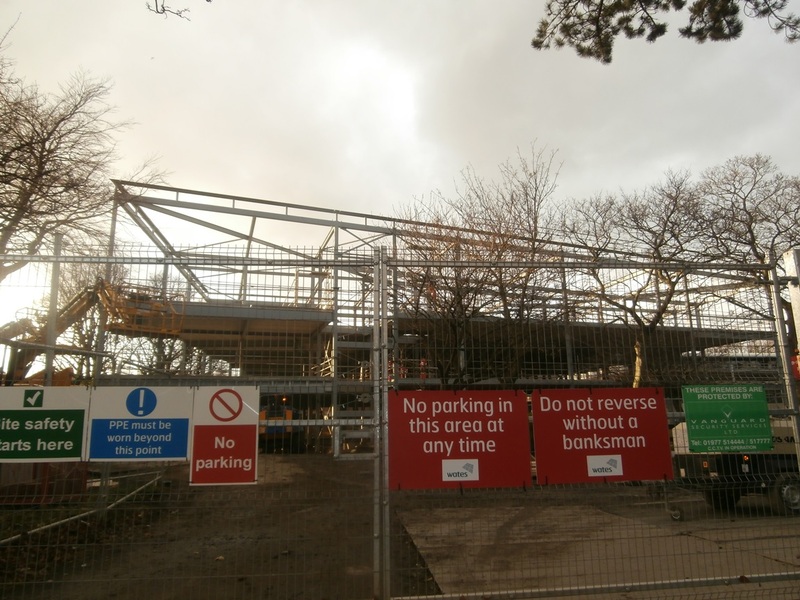 The site access seemed nearer than it should have been and, when I arrived there, looked very different: a second site access had been created at the far end of the staff car park alongside the Sports Hall. I later learned this had been in place for two months, unbeknownst to me; it certainly offered a different perspective on the new build. 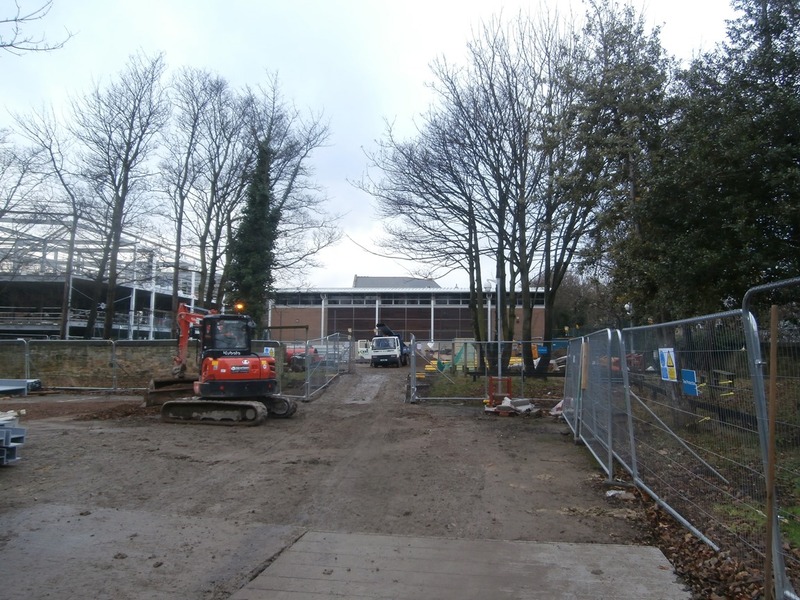 New approach route reveals 2nd site access by Sports Hall. 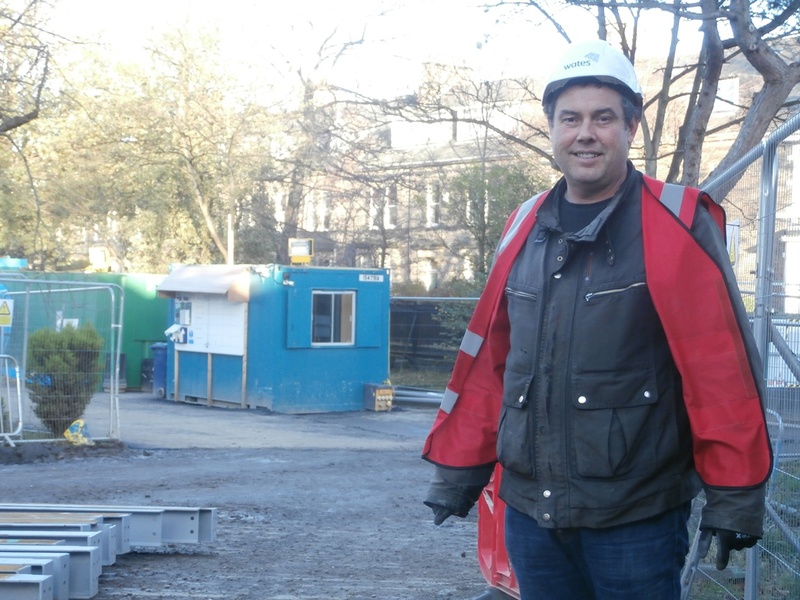 There were new workmen on site today and the gentleman pictured below had already been bowled over by the architecture within the old building so we hit it off from the start. Knowing that last week just a small area of floor was left to be laid under the new build, I had expected my attention to be focused there first today. 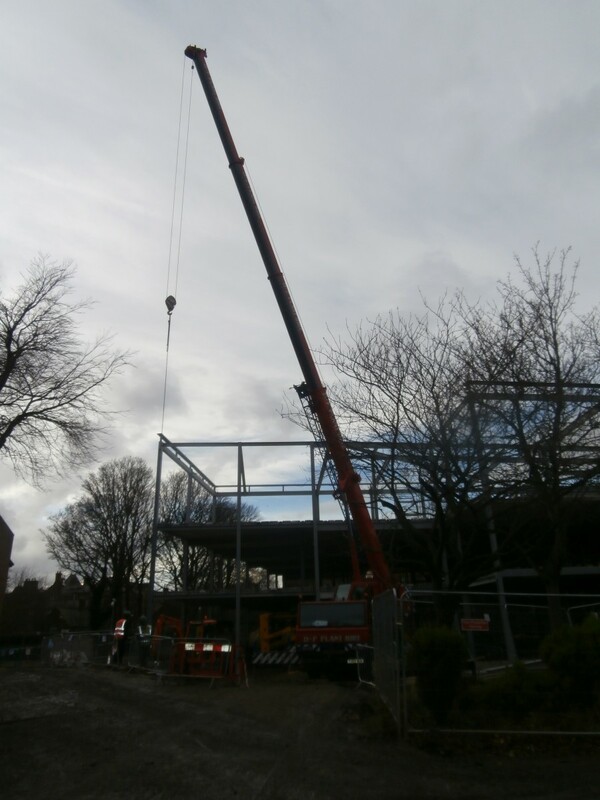 Instead my eyes were immediately drawn to the big red crane now positioned in the area of the new extension with a shiny stack of grey metal nearby. 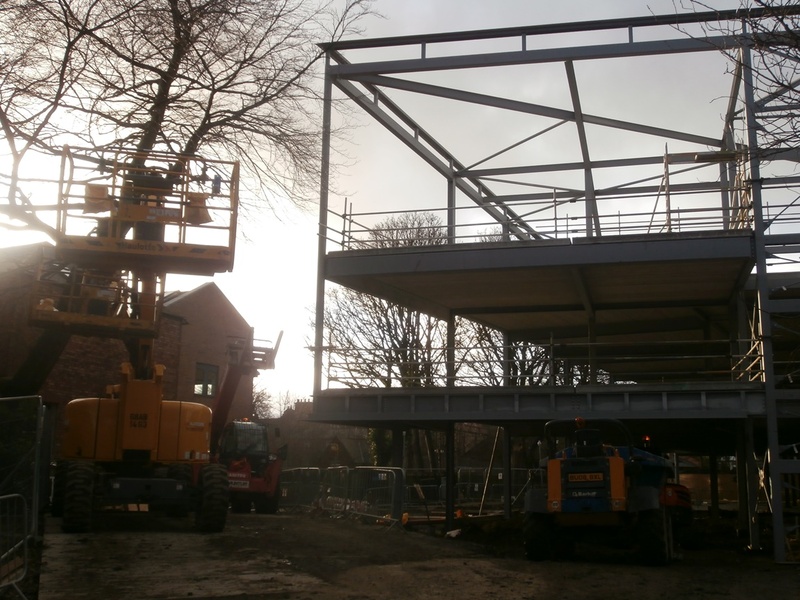 The first load of steel for the new extension had now arrived and work was clearly underway on the construction of the main frame. 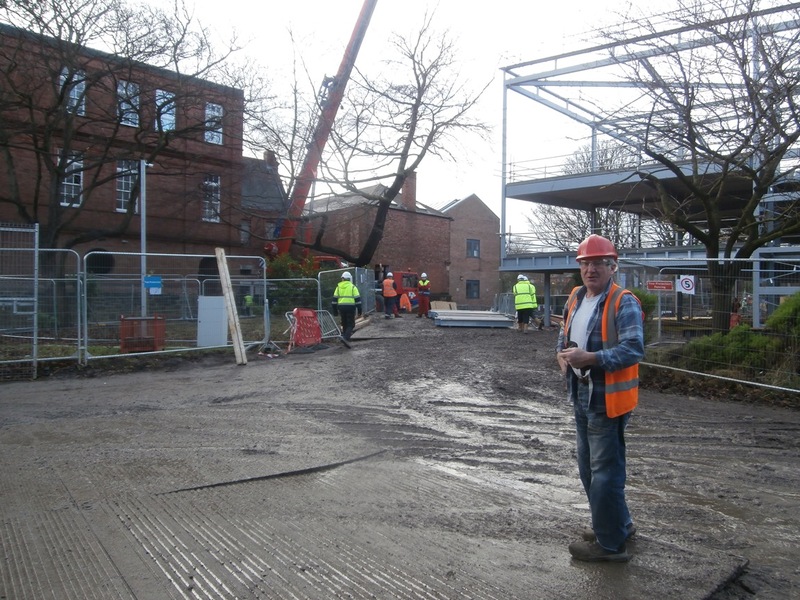 A big red crane & newly delivered steel mark the new extension site with new man-on-the-job, Bob, in the foreground. 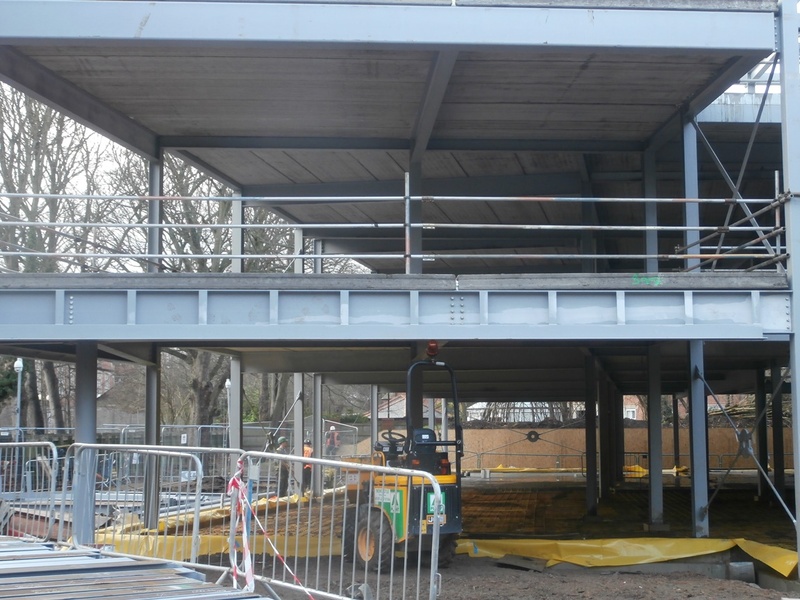 This modern extension to the old building will not only be glass-fronted, it will also house the relocated north staircase following the demolition of the old wooden stairs by Thompsons earlier in the year. Plans on display in the Entrance Hall of Wates’ Site Office in Westward House show the position of this new flight of stairs. 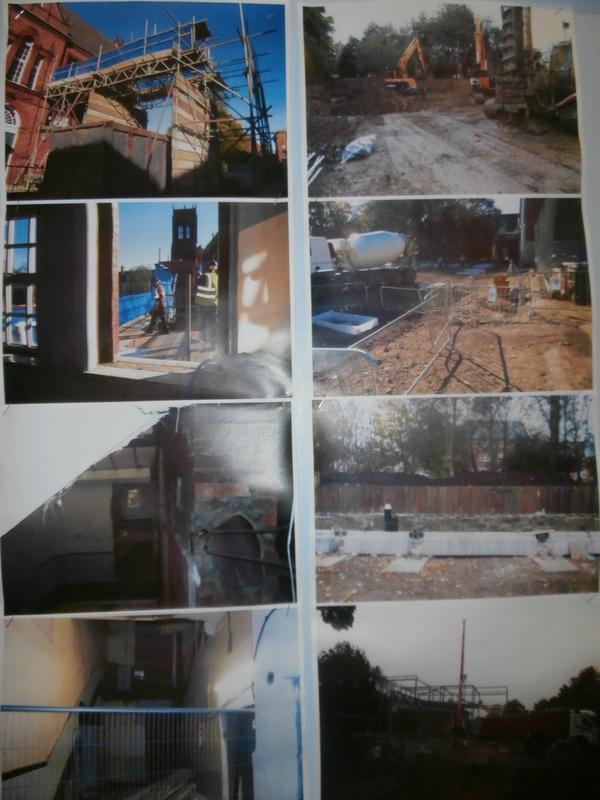 Photographs of site work reproduced alongside also include an image (bottom left) of the site of the original stairs post demolition. 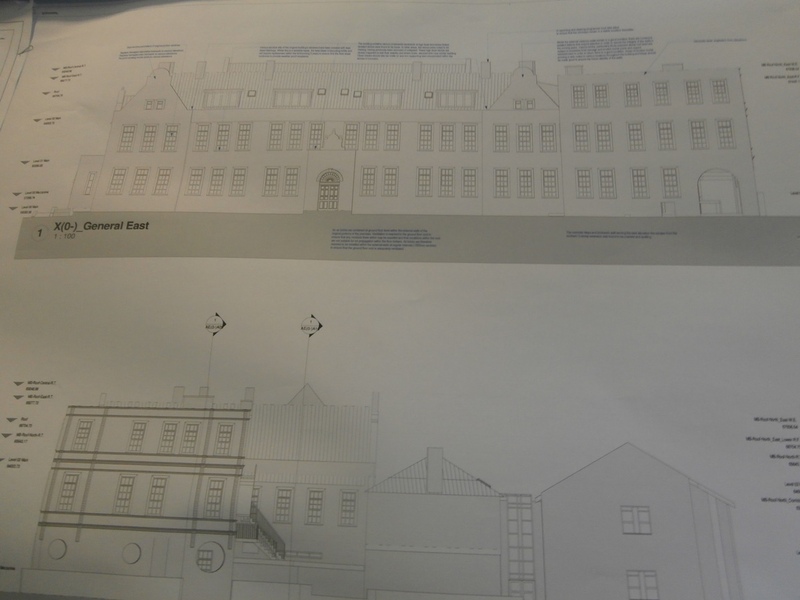 Elevations of the old building in Westward House show the intended position of the new extension stairs (bottom left). 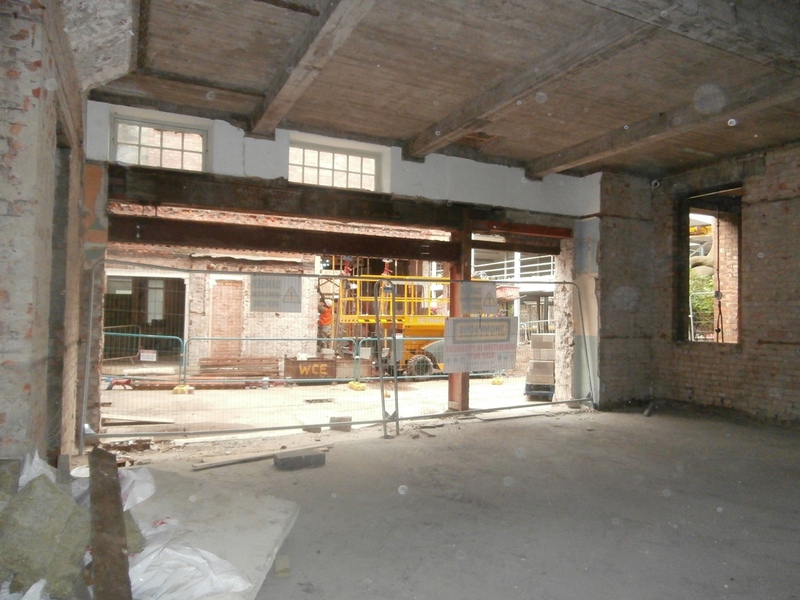 Wates’ photos in Westward House of the demolition work also show the site of the original wooden north staircase (bottom left). The final work on the new build floor was at an interesting stage too. True, the last section of concrete had not yet been laid, but by arriving on site today I was able to see up close through the lens of my camera the metal caging now all in place waiting to receive it. The last bit of new build floor is ready for the concrete. Leaving the site to make my way back down to Eskdale, I looked for a bin to discard the Starbucks coffee cup bought on Acorn Road, which had previously been warming both my hands and my insides. The nearest one was behind Tankerville House and on crossing the road I realised that, despite working in these buildings for 29 years, I hadn’t ever looked at the Sixth Form block from this angle before. Tankerville Sixth Form block from the rear. 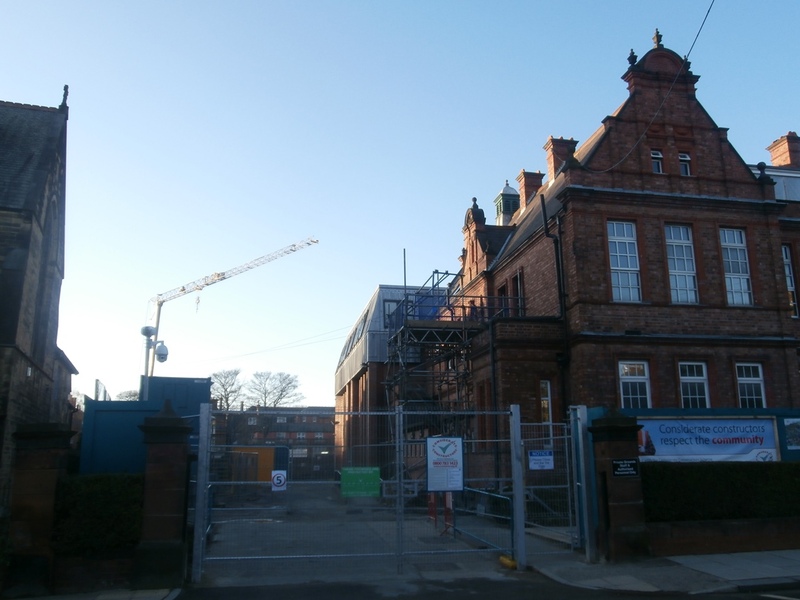 This building once housed Church High Junior School before the modern Junior School was built on adjoining Orphanage Gardens land. 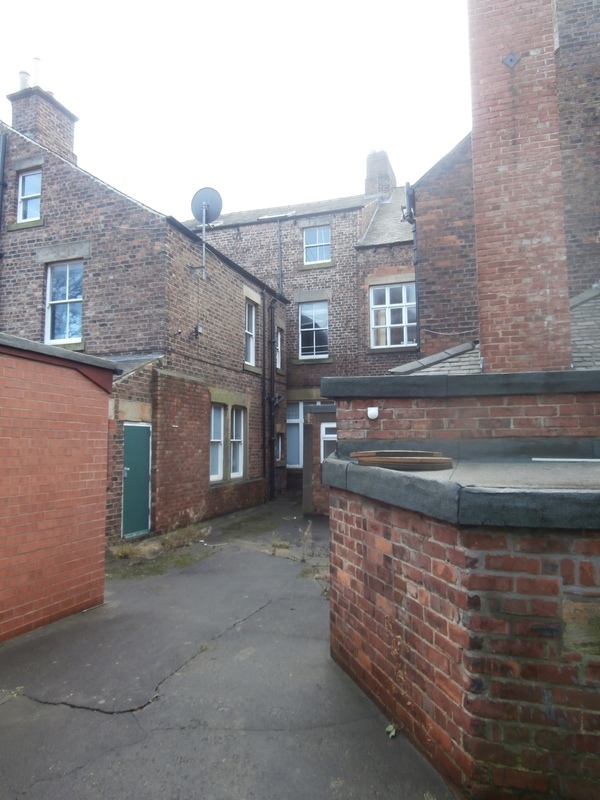 It made me smile to see the Modern Foreign Languages Department’s satellite dish still in place, marking them as the last inhabitants of 1, Haldane Terrace which adjoined Tankerville House. 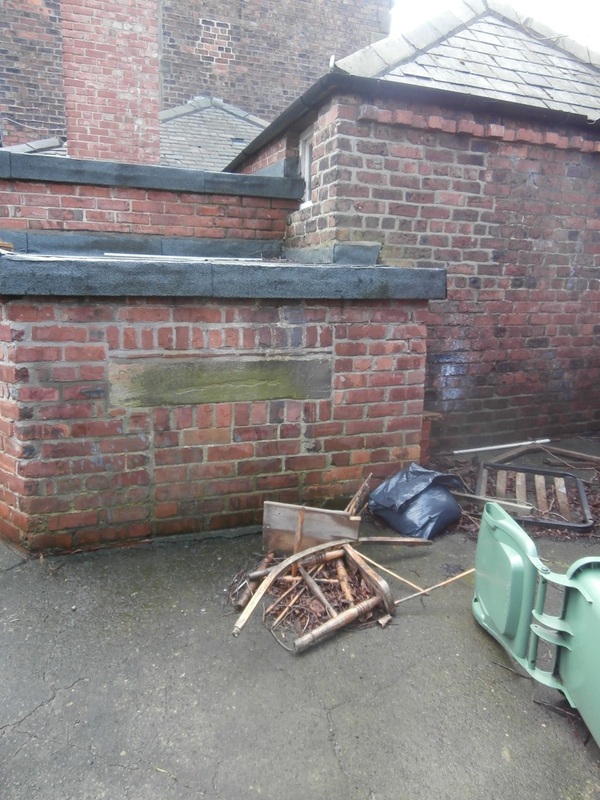 However, my attention was quickly drawn to a ramshackle pile of old wood just beyond the gate which must have lain there exposed to the elements for the last year and a half. Sad yet also amazing. As I mused on this, I suddenly realised I had a fair idea what it was. Old wood long forgotten behind Tankerville. I have always had a love for old wood; it was once a living thing and when worn and misshapen by age, it is always fascinating to wonder how many bodies have touched it over the years to make it that way. Arriving at the site gates today, the structure had a different feel somehow. It wasn’t just the break in the clouds, it looked complete. And so it proved when I talked to Peter once inside the compound. 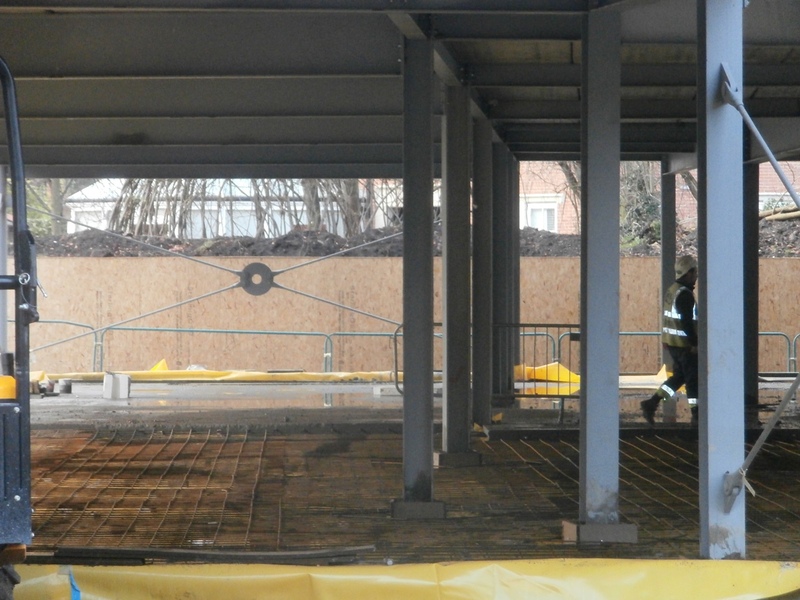 The last corner of the steel frame, where the entrance to the new building will be, was now all intact. It looked huge from the ground. The last corner where the entrance will be is now complete. 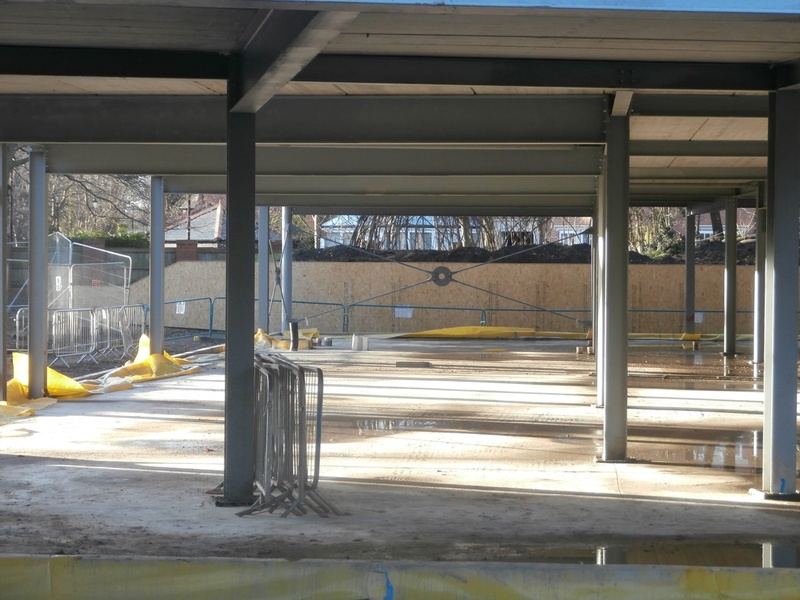 All that was now left to do at ground level was to finish off the final section of concrete flooring, the rest having been laid last week. 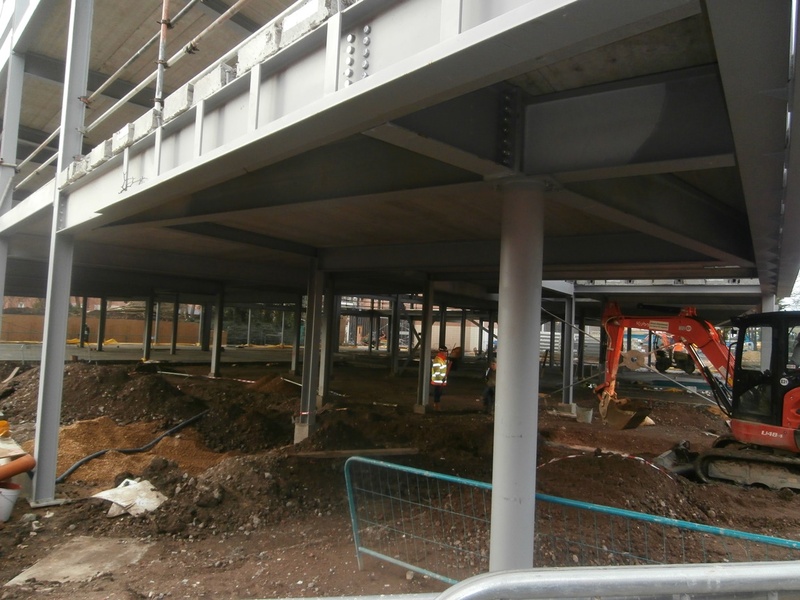 Under the structure, the last bit of floor still needs to be laid. I also learned from Peter that Thompsons, the demolition and dismantling contractor, had finally left the old building. This meant that ‘construction’ work was now able to progress inside. Luckily for me, one of the very kind and helpful Wates’ workmen offered to take my camera into the building again, only for a short while, but long enough to show how the work was progressing on the ground floor. It’s safe to say that his offer, an early Christmas gift, ‘made my day’. A few weeks ago, one of the Thompsons’ workers had told me I would still be able to find my way fairly easily around the old building. Most rooms, even if their usage was changing, remained in the same places, he said; it would be largely a case of some doorways and windows not being where they used to be and others being opened up elsewhere. The first picture taken showed this to be true. 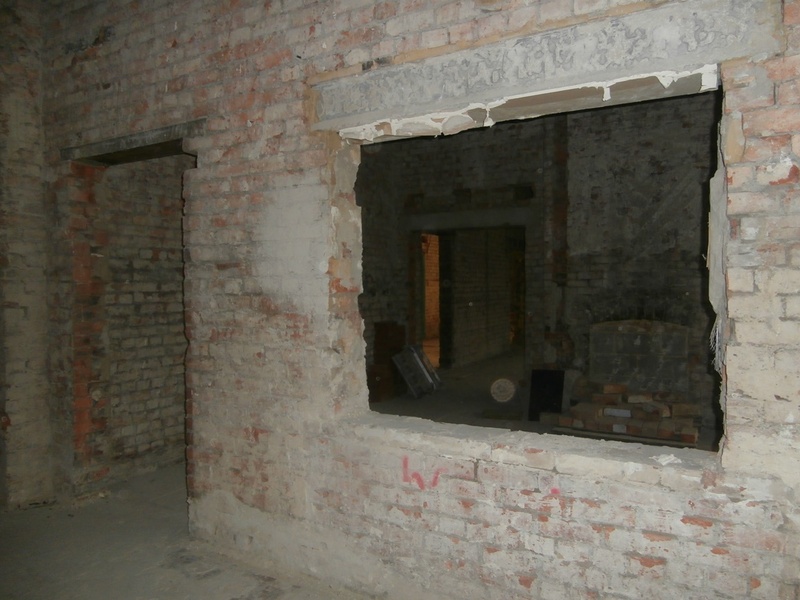 As he walked into the old building across the new extension foundations, the next shot the worker took shows the old Large and Small Dining Rooms with plaster stripped right back to the brickwork. The old Large & Small Dining Rooms from the kitchen area. 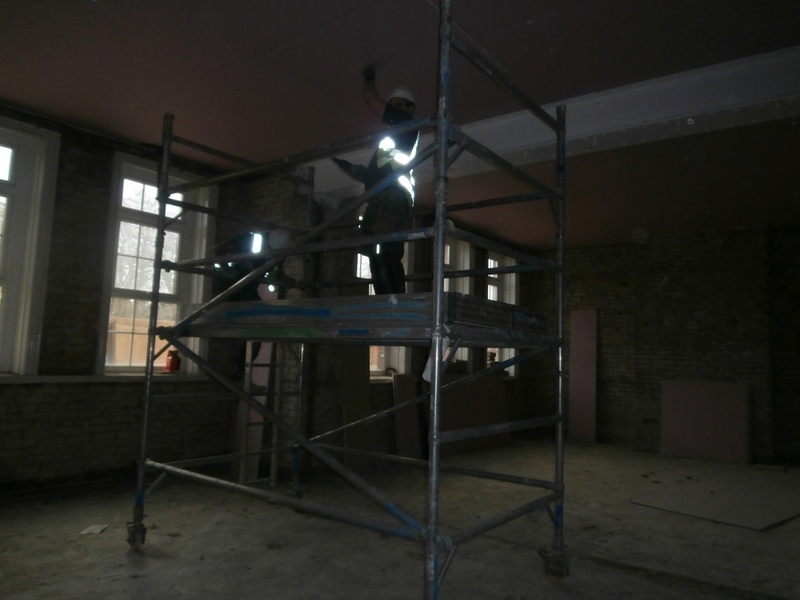 The scaffolding working tower just visible at the centre of the previous picture is being used by two workmen in the process of affixing new plasterboard to the ceiling of the Large Dining Hall. Plasterboard now being nailed to the ceilings of both rooms. The next image the worker took for me, of the Entrance Hallway looking towards the Main Door, was obviously taken from in front of the Learning Resources Centre. 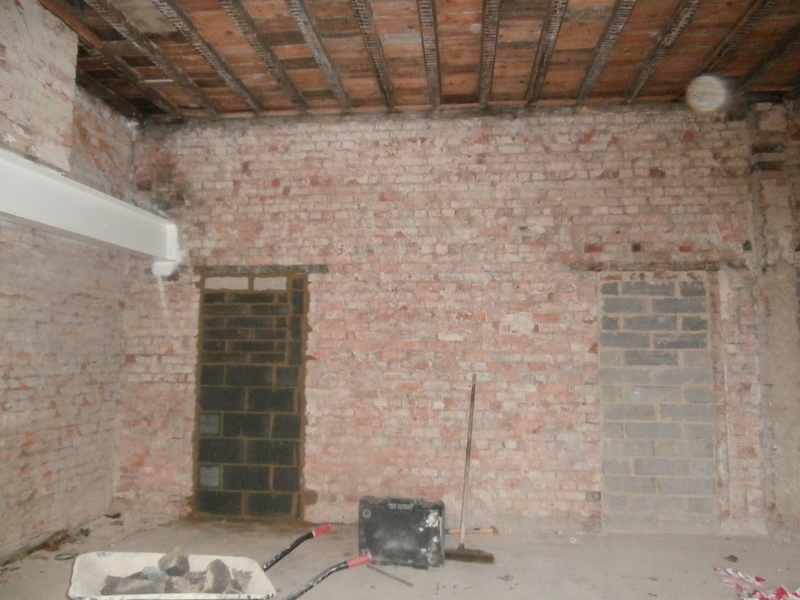 Once again this area has all been stripped back to the brick and rafters; the grey breeze blocks to the right indicate where the door to the Meeting Room used to be. 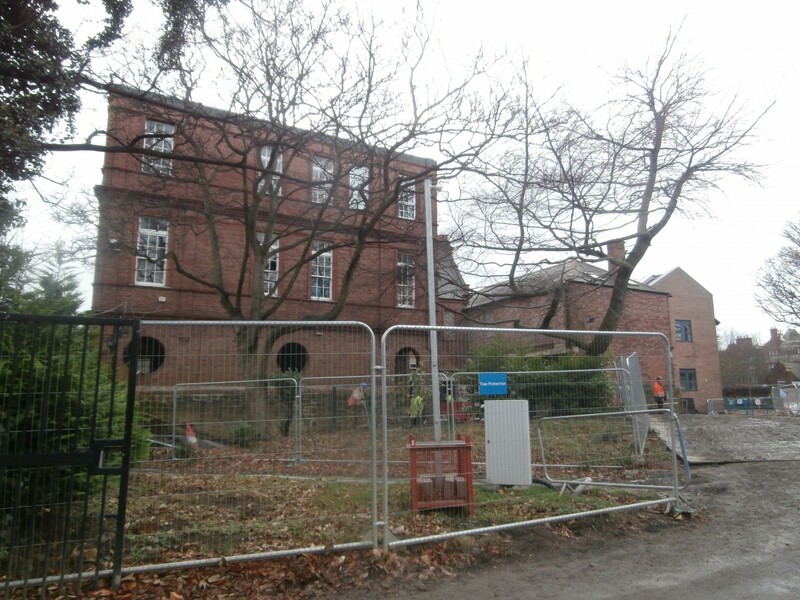 The wood and glass Entrance Lobby doors, which were operated by a touchpad door-code system, have now both clearly been removed. It was a joy to see the semi-circular window-light still in situ though. 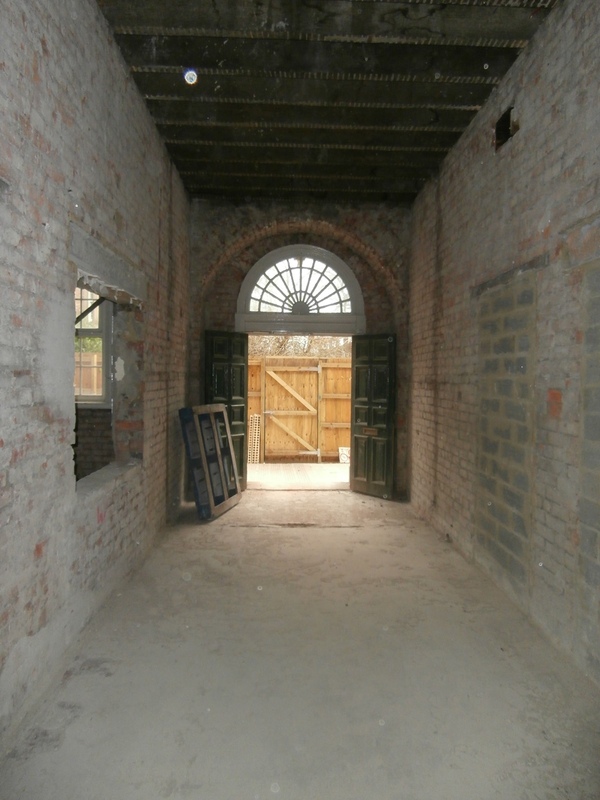 Entrance Hall looking towards front door. 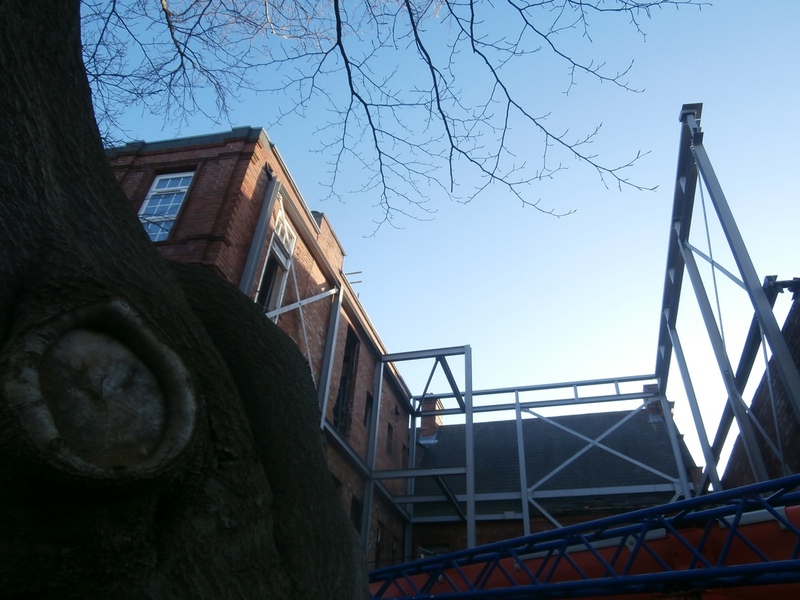 The workman, on his way towards the front door, had clearly turned to his left and photographed what would until recently have been every visitor’s point-of-view when they entered the old building: Reception to their right with the Senior School Office behind it. In this shot, the doorway into the Head Mistress’ Office can also be seen, with its doorway out onto the bottom corridor to the left of it. 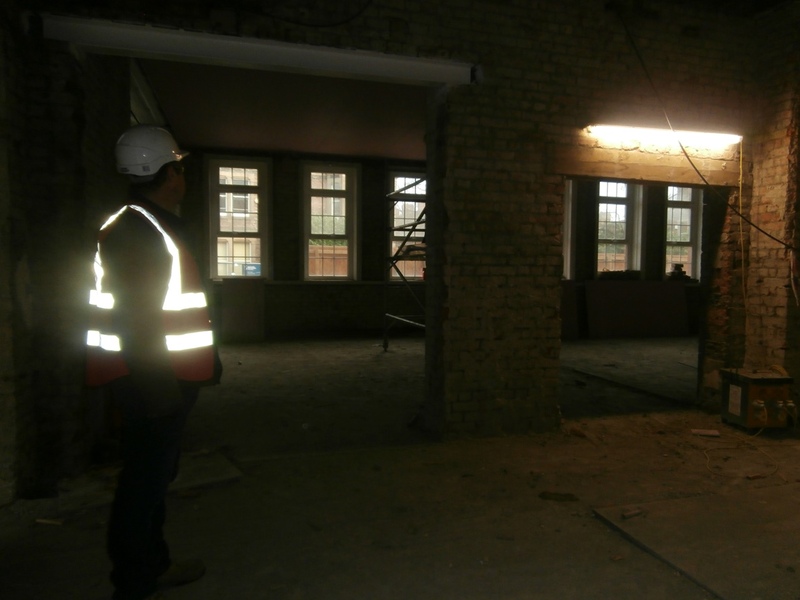 From the hallway looking towards Reception into the old Senior School Office and Headmistress’ Office beyond that. 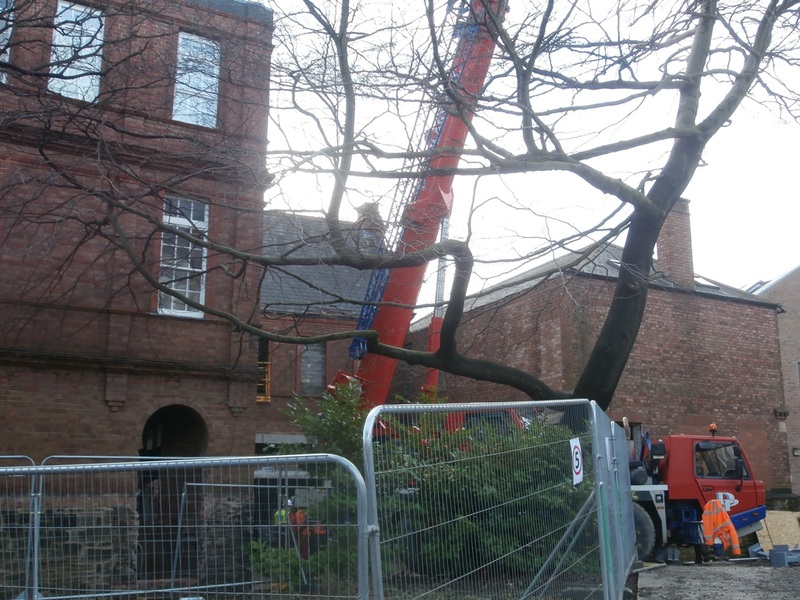 The workman had then clearly gone through the open front door and turned back towards the LRC. 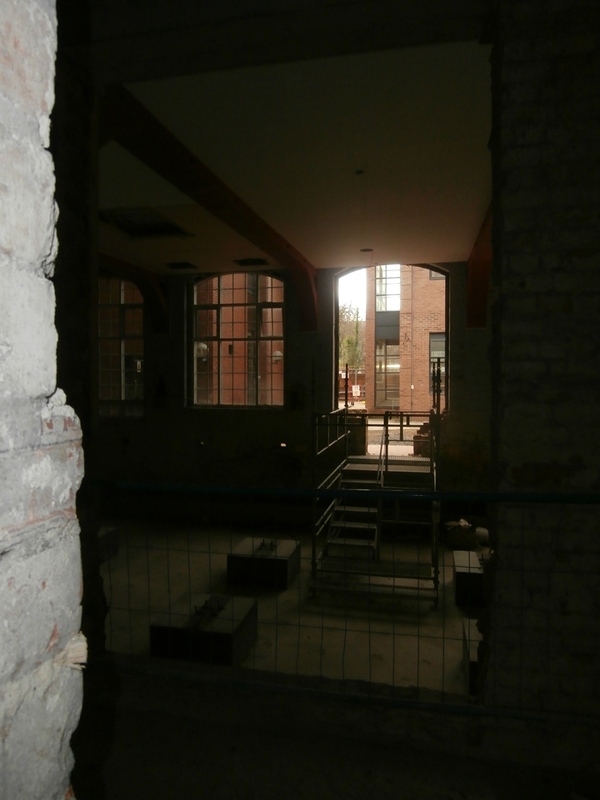 In this shot it is possible to see through to where a window has been temporarily removed to allow site access via the rear courtyard to this inner area of the building. Main Front Door looking towards the LRC. 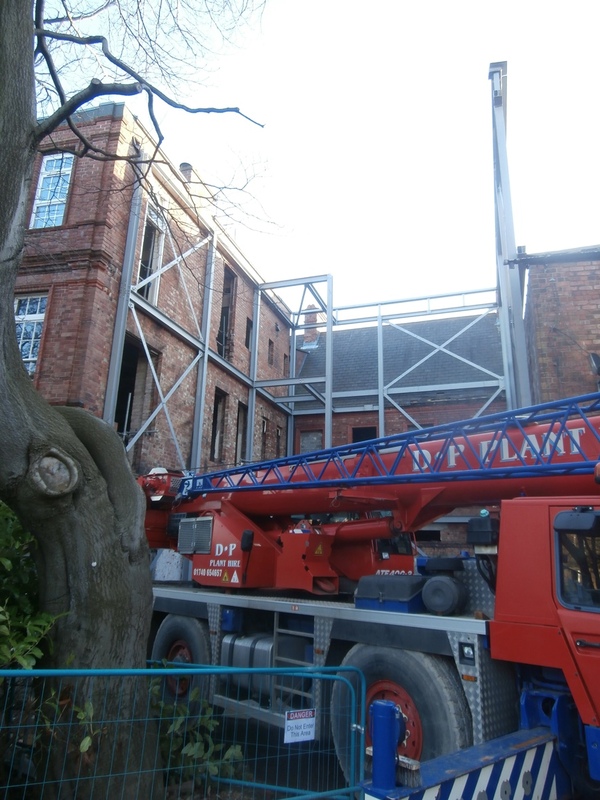 As we know, the biggest changes within the old building will be in the LRC. 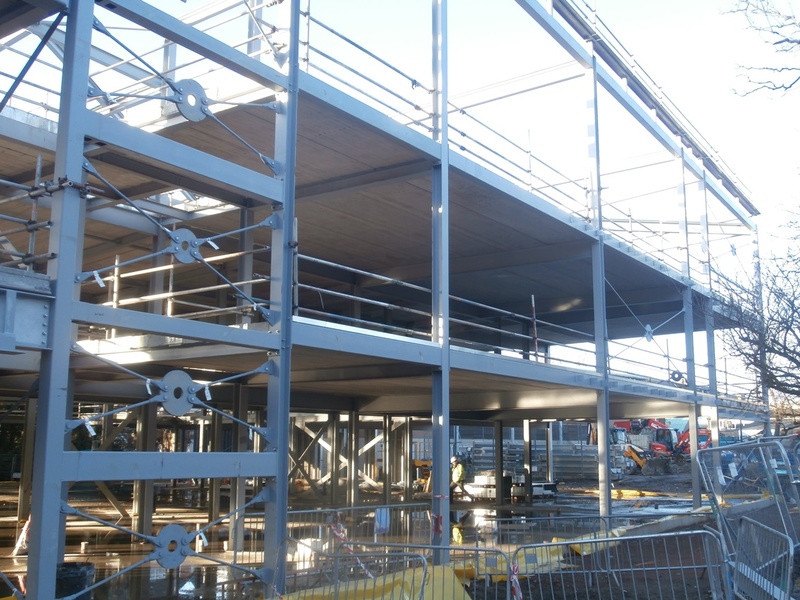 A decision has been made to raise the floor so that the room will be all the same level when the building becomes NHSG. 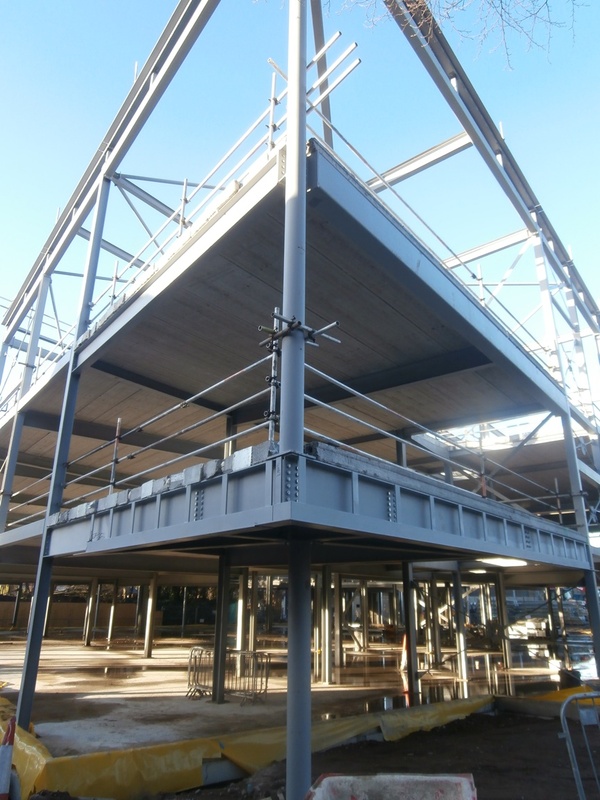 In order for this to happen, concrete columns are in the process of being created in order to support the newly-raised flooring. The idea is to create a light, clear view from new Reception right through to the courtyard beyond, but I will still miss the dynamic sense of energy that the mezzanine levels and sweeping staircases created. Centre view of the LRC onto back courtyard. 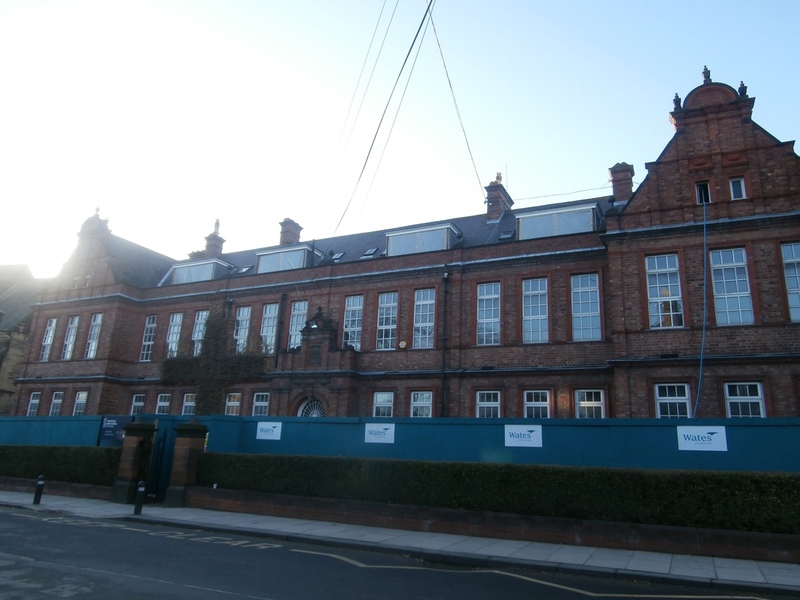 The LRC, of course, once used to be the old School Gymnasium, the first purpose-built gymnasium in the city indeed. Old Girls and ex-staff will remember there was a raised platform at one end of the room and one had to descend a small flight of stairs to enter it whichever doorway you used. The doorway leading out onto the Science corridor and locker rooms used to have a yellow curtain across it to keep out draughts. Countless girls doing exams in that space will remember hearing the clinking noise of the brass curtain rings as it was pulled aside by invigilating staff as they entered and left the room at the end of each session. 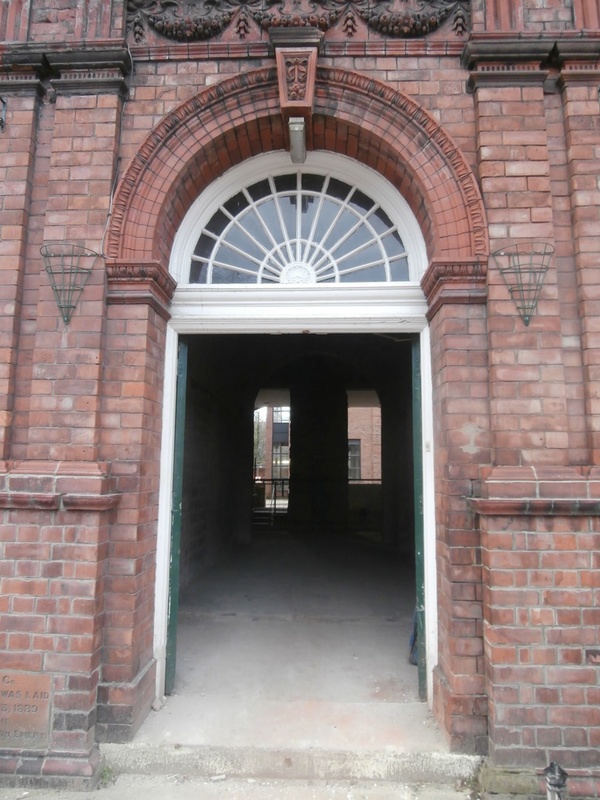 In the present renovation process, now that the glass-fronted Careers Room has been dismantled, this doorway has once again been opened up. It seems that in the new LRC this old doorway may have a new life as a window. 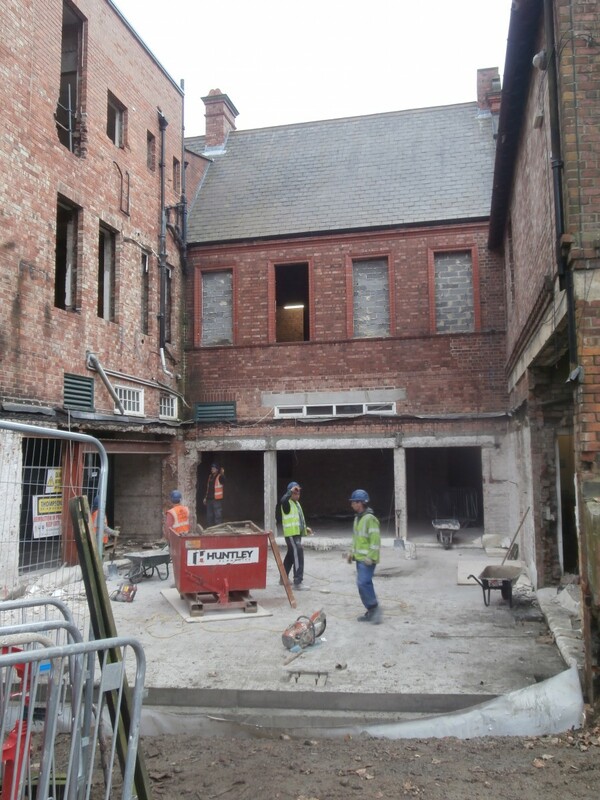 The LRC under reconstruction looking to the left where the glass-fronted Careers Room used to be. An old doorway has been opened up again and will now bring light to the room. 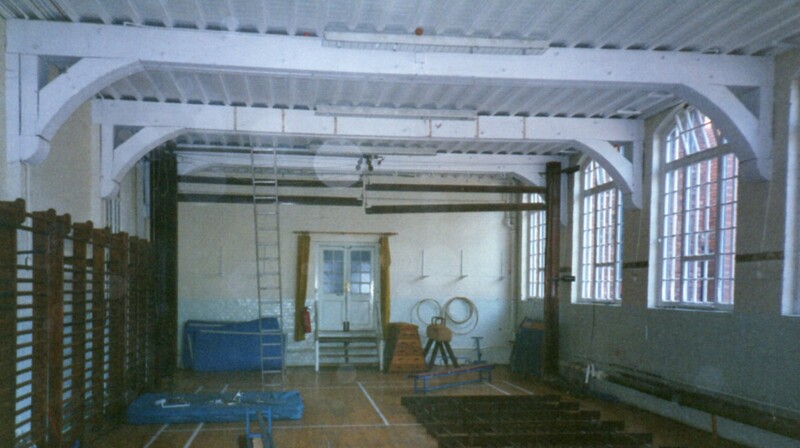 The Old Gymn being dismantled in 1997 prior to the LRC. LRC looking right with the new Technology Wing beyond it. 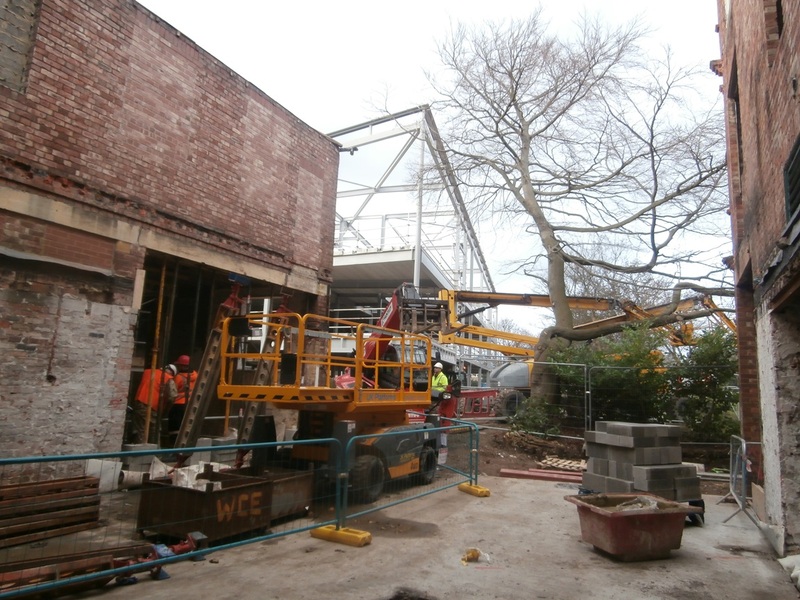 My worker was now making his way back out of the building again, taking a fascinating shot before he left it from the Dining Hall area looking out across the foundations of the new extension; this area until very recently used to be a single-storey kitchen space. 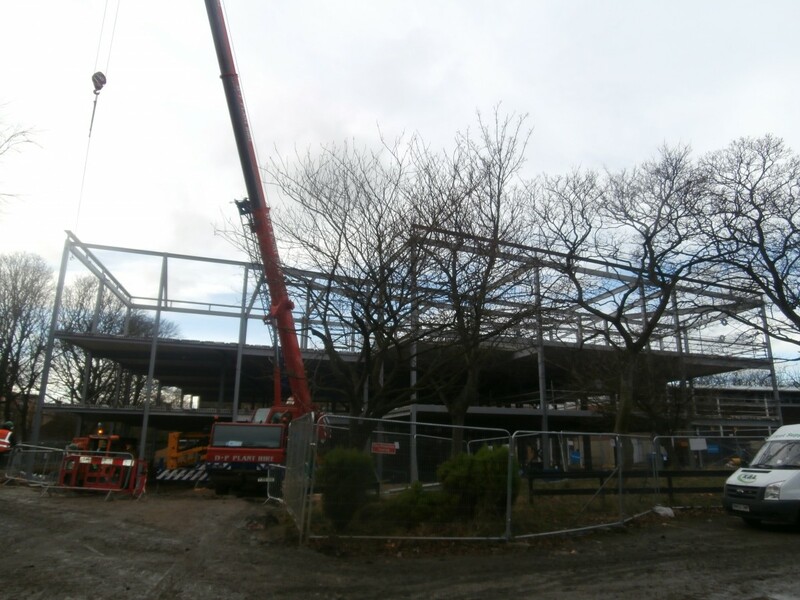 The area of the building visible beyond used to be the kitchen storage and refrigeration areas; this will become the new ICT Room. 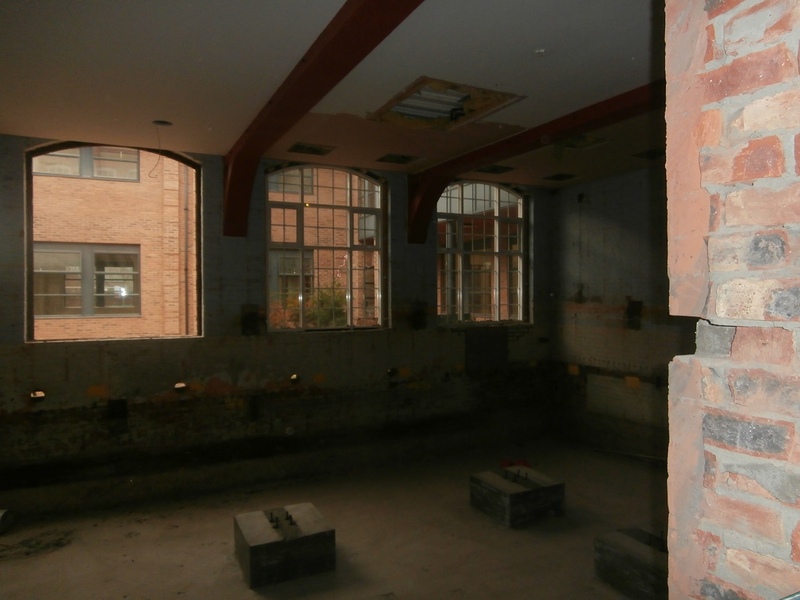 From the Dining Hall looking out onto the new extension. 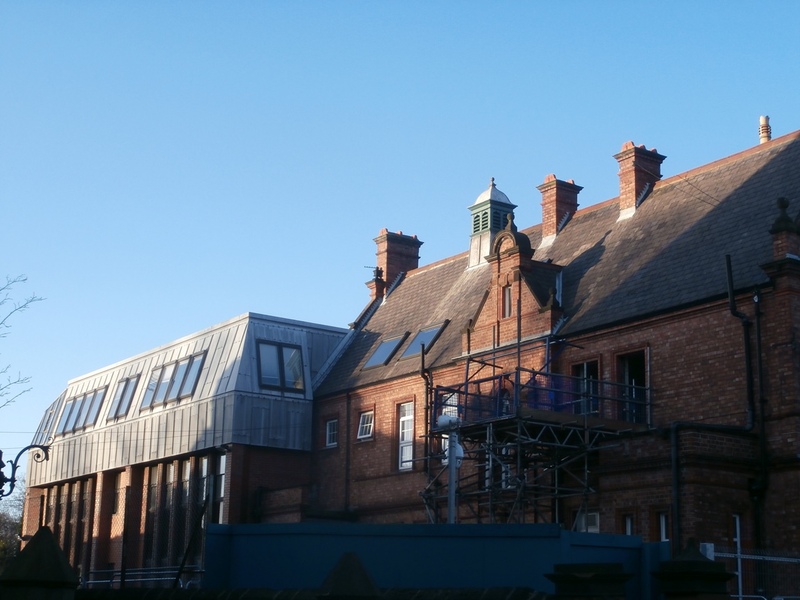 The final shot, taken from the very back of the new extension foundations, shows how the two buildings, old and new, will closely align. 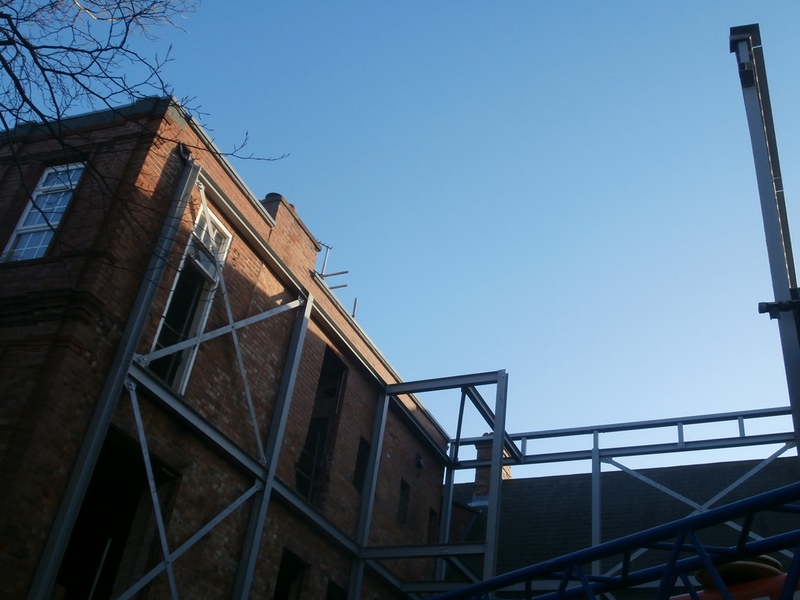 View of new build from the old build extension foundations. Longman’s Contemporary Dictionary tells us that ‘if the weather is grey, the sky is full of clouds and the sun is not bright’. Such a day was today: there was no doubt that we were now in December. Grey clouds, grey steel, grey mood. 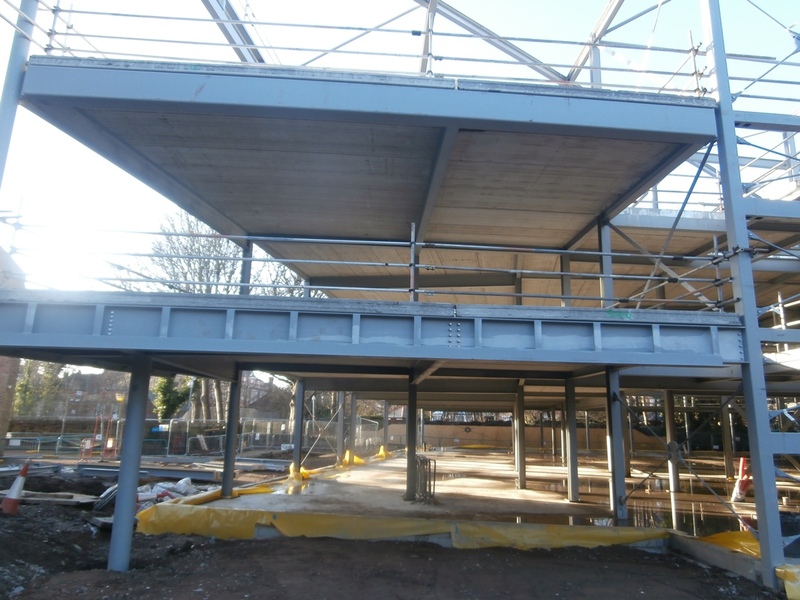 Whilst the new build structure was clearly more advanced each week, it was becoming harder to photograph in different ways and now it only just fitted into frame. 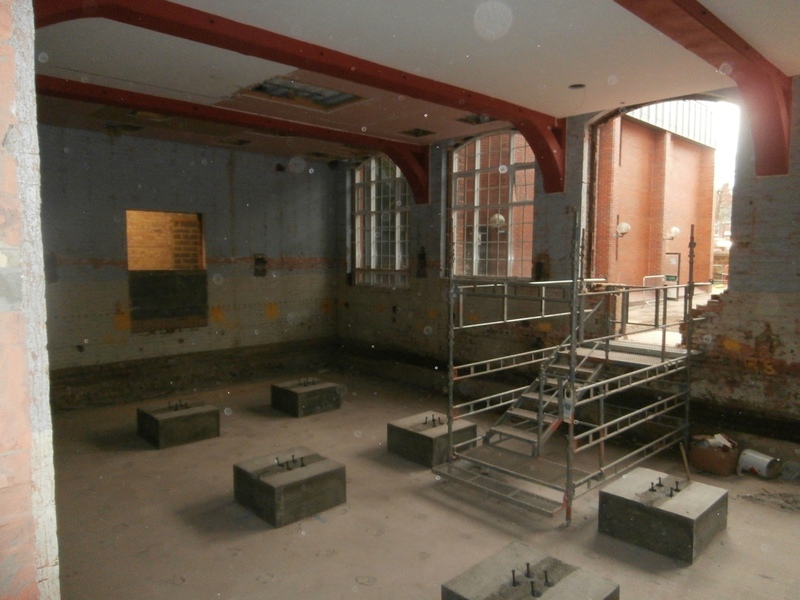 Today, though it was exciting to see a concrete floor now in place, even at the old building extension the main colour was also grey. A grey concrete floor has recently just been completed in the old building extension. Looking back over my shoulder as I left the site, there was a sense of brittleness and sparseness that only Winter brings to Tankerville. The trees look so much smaller bereft of all their leaves and the broken pane of glass I now noticed in one of the staffroom windows did nothing to alleviate that sombre dog days of December feeling. Grey December Day: broken window pane & winter trees.